Not too far from Highland Titles Nature Reserve, on an island in the middle of Loch Leven stands the remains of a castle, once owned by the Douglas family. There they would often play host to their relative and friend, Mary Queen of Scots. It was during one of her visits that she summoned the intractable Protestant, John Knox for one of her famous debates over religion. Later on it became her prison and the Douglas family her less than friendly jailers. Today the castle island is four times the size it was in Mary’s day, the loch having receded over the centuries. In Mary’s lifetime it became a royal stronghold, considered completely secure and inescapable. Somewhere in the grounds of that castle lie buried the tiny bodies of her stillborn twins, offspring of her scandalous third marriage to the Earl of Bothwell, the man suspected of killing her second husband. The story of Mary Stuart, the last queen of Scotland is a compelling one. Both brilliant and foolish she reigned in a time of great danger, when female monarchs had to outplay all the ambitious males around them. Unlike her cousin Elizabeth I however, Mary Stuart lost the deadly game of thrones. Mary was born on 8th December 1542. Just 6 days later her father, King James V of Scotland, died tragically young, and Mary became queen long before she should have been. Several regents jostled for power throughout her childhood. When Mary was still an infant, Henry VIII tried to form a treaty in which his son Edward (VI) and Mary would be married. But Henry’s list of conditions were high-handed and the Scots had long memories of English treachery. After an initially positive response, they rejected the treaty. Furious, Henry VIII commenced the last war of his reign. Euphemistically known as the ‘rough wooing’, this 5-year war demolished towns throughout Scotland. It was the intervention of the French that saved the day, and the Auld Alliance which Henry VIII had wanted Scotland to sever as one of the terms of his demanding marriage treaty. At the age of five, Mary was betrothed to the French Dauphin, the future François II of France, and Mary was sent to the French court where she learned to speak fluent French, Spanish and Latin. she was well loved by the French king and dazzled the courtiers with her brilliance and charm from an early age. She and the Dauphin grew up together, became very fond of each other and were married in 1558 in Notre Dame Cathedral amid huge spectacle and festivities. Mary was 15 and the Dauphin 14 years old. 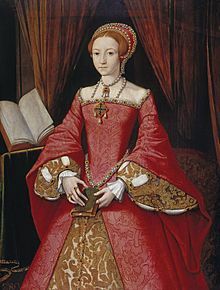 Later that same year the Catholic English queen, Mary Tudor died, having already acceded from Edward VI‘s short reign. The Englishcrown had passed across the heads of all Henry VIII’s children in just over a decade landing finally on his youngest daughter, Elizabeth. In Catholic eyes Elizabeth was the illegitimate spawn of Anne Boleyn, from a scandalous marriage that had been annulled. Whereas Mary Stuart, Queen of Scots was the granddaughter of Henry VII of England, and far more legitimate than Elizabeth could ever hope to be. Hearing of Mary Tudor’s death, the French King Henry II loudly announced that Mary Queen of Scots was the rightful Queen of England. Because of this, Queen Elizabeth would never trust Mary Stuart; as long as she lived she would always be a threat. If Mary had understood this perhaps her choices would have been different, but she made the disastrous mistake of thinking her cousin Elizabeth was a friend.